The most extreme indoor dirt bike contest in the world known as super enduro just had an incredible finish to its 2016 season in Spain. It was a fitting end for the most chaotic arena motocross circuits on the planet, the FIM Super Enduro World Championships. The only class nuttier is probably hard enduro, which takes place outdoors. 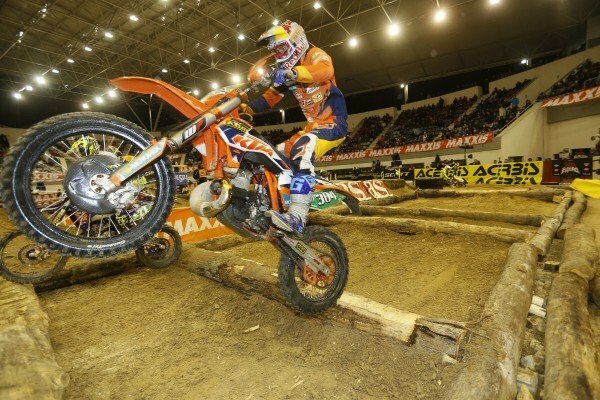 In this year’s super enduro finals in Spain, the top two riders traded positions on the final lap until the underdog, Colton Haaker, overtook Cody Webb, both Americans, for the title. Bringing the chaotic action on film once again is the team at Red Bull TV. Watch these motocross athletes take their machines to the next level, negotiating tree trunks, rock boulders, giant tires and much more. The most recent event in Spain was held in the bull rink of Las Rozas, a fitting location for an event described as part motorcycle race, part demolition derby. At the beginning of the final heat, Haaker found himself in 9th place with Webb in the lead when he mounted a near miraculous comeback, climbing his way to the leader position. “I thought I’m screwed! And I did the only thing I could. I went forward and put everything I had out there,” he told Enduro ABC. Taking the junior title was 17-year-old Manuel Lettenbichler who dominated his class with 15 out of 17 wins. For complete coverage visit Red Bull TV.